When Turkey entered WWI as an ally of Germany in November 1914, the British possessions in the Middle East were suddenly vulnerable. After repulsing Turkish attempts to invade British-controlled Egypt and capture the Suez Canal, a vital transportation link that connected Britain with India, the Egypt Expeditionary Force (EEF) took the offensive. Having been driven out of the Egyptian Sinai Peninsula by late 1916, the Turkish army fell back to Palestine and built a twenty-five-mile-long series of fortifications with five bases: Gaza, Djenmach, Tel-es-Sheria, Beersheba and Ramleh, that prevented the EEF from reaching vital water supplies and linking up with the Arabs that had revolted against the Ottoman Empire in early 1916. Frustrated by the apparent inability of the Allies to gain ground on the Western Front, the new British government of David Lloyd George pressed the army to move into Gaza, hoping that a successful invasion of Palestine would take the pressure off the Arabs and improve the revolt’s chances. By early 1917, the British campaign in Palestine was producing few results, other than a disturbingly long casualty list. When General Sir Archibald Murray, commander of the EEF failed for the second time to capture Gaza, the strong point of the Turkish lines, he was replaced by General Edmund Allenby, who decided to feint at Gaza and strike at Beersheba. To encourage the Turks to fall for the feint, Major Richard Meinertzhagen, Allenby’s intelligence officer, executed a ruse where a haversack with apparently genuine plans for an attack on Gaza was allowed to fall into the Turks’ hands. The British infantry would attack the main defensive lines at Beersheba while the Desert Mounted Corps (including the Australian Light Horse) would circle around to hit the rear from the desert, since the Turks believed that the lack of water in the desert would make an attack from that direction impossible. Since the British were not bringing enough water for an extended siege, the attack would have to be abandoned if the town was not captured with its water supplies intact on the first day. 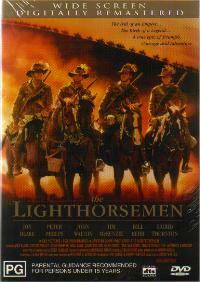 The story largely follows a section of four Lighthorsemen during the Palestinian Campaign during WWI. Like many men in the Lighthorse, they had served at Gallipoli and are happy to have survived the experience. 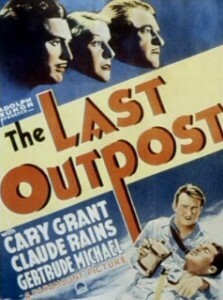 The veterans do not easily accept the new recruit in their section, until he wins their respect by saving their horses when a plane attacks the camp. Injuries result in him being sent to the hospital where he falls in love with his nurse. General Murray, commander of the EEF, is clearly out of his depth. Even his opponent, General Friedrich von Kressenstein, commander of the Turkish army, admits that the first victory at Gaza was due to General Murray retreating because he did not realize that he had already captured the town. When General Murray fails for the second time to capture Gaza, the strong point of the Turkish lines, he is replaced by General Edmund Allenby, who decides to feint at Gaza and strike at Beersheba. To encourage the Turks to fall for the feint, Meinertzhagen, Allenby’s intelligence officer, executes a ruse where a haversack with apparently genuine plans for an attack on Gaza is allowed to fall into the Turks’ hands. Lt. Col. Ismet Bey, commander at Beersheba, does not fall for the ruse, but his German adviser does. The British infantry would attack the main defensive lines at Beersheba while the Desert Mounted Corps (including the Light Horse) will circle around to hit the rear from the desert, which was considered impassable due to a lack of water. Since the British were not bringing enough water for an extended siege, the attack would have to be abandoned of the town was not captured with its water supplies intact on the first day. Although the Turks are heavily outnumbered, the ANZAC infantry are unable to break through the Turkish lines. The commander of the Lighthorse Brigade suggests a mounted charge, even though no one thought it could be done. Expecting the Lighthorsemen to dismount, the Turks are taken by surprise and overwhelmed. Although the script follows the facts closely, it takes a bit of artistic liberty by showing that the wells are captured intact because of the heroism of one soldier. While the charge may seem unbelievable, it is actually extremely accurate. Since the cavalry had to cross four miles (6.4 kilometers) of flat terrain, they should have been shredded by the enemy artillery but the Turks did not expect a cavalry charge from mounted infantry and waited too long to start firing. Also, the 4th Light Horse Brigade (Australian) charged in lines three hundred yards apart with five feet between each trooper in order to deny the cannon and machine guns easy targets. The psychological impact of such a powerful, rapid charge meant that many of the Turkish troops were too unnerved to fire accurately. The charge is truly cinematic, especially since it was real, not digital. There is no denying that Murray was a better administrator than battlefield general. Allenby was a cavalryman who had just come from the endless and futile trench warfare in France where the British general staff repeatedly tried and failed to achieve a breakthrough that would enable the cavalry to pour through the German lines and rampage through the enemy’s rear, therefore he eagerly embraced the greater possibility for movement in the Palestine. The actor playing Allenby does not have his forcefulness. Allenby was nicknamed Bull for a reason, and his staff would send out the message “the bull is on the loose” whenever he left HQ because no one could predict what he would do or where he would go. I am not sure how accurate the portrayal of Meinertzhagen is, but it is a great performance, cynical, brave and smart with a wicked sense of humor. Dave and Anne are based on a real couple who married after the war. The men are tough but fair and limit themselves to good-natured ribbing, so they do not look down on the new recruit when he proves unable to kill. While I am happy that the script avoids unnecessary melodrama, the movie lacks creative spark and the characters are a bit two-dimensional, as if the screenwriter did not want to offend the real people they were based on. However, the scenes where the soldiers joke among themselves as they try to forget that they have been away from home for three years are very good. The understated and straightforward nature of the story may explain why the movie failed to find an audience outside of Australia, and why it is probably not as well-known as other war movies featuring Australians like Breaker Morant (1980) and Gallipoli (1981). While it is not an engrossing film, it deserves to be seen by more people since the Palestine campaign in WWI has received little attention in Hollywood, and the final charge is astounding, even on a small television screen at home. 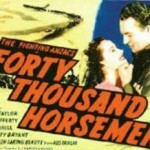 No horses were killed or injured in the making of this film, which says something for the horse handlers given the intensity of the charge. I remember seeing the charge scene from this film in school in the US; I haven’t been able to find it since. Meinertzhagen, whom I have read quite a bit about, was a very colorful but controversial character, and it is uncertain if the “haversack ruse” was anything at all like he described or even his idea. 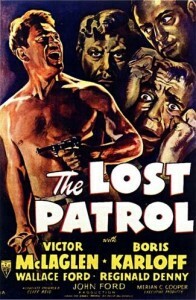 His portrayal sounds very much as he presented himself and his reputation at the time the film was made, but he has latterly been presented as a plagiarist, con man, and possibly a murderer. Another of his tricks had been during the East African campaign; he collected information about the German forces there by digging up their latrines, as they had resorted to using their obsolete records for toilet paper! A wonderful site that I have only just discovered. I look forward to reading more. Thanks for the information about Meinertzhagen. digging up latrines is not the greatest image, but the ruse was very interesting, so I hope it actually was his idea. Thank you for the kind words, and I hope that you enjoy the site. “Australia’s Palestine Campaign” by Jean Bou is a good read for those interested in the subject. Published by the Australian Army History Unit.